Stock photo of a work of art, a wooden Bakwas mask by Don Svanvik, Kwakwaka'wakw First Nations artist, original West Coast native art, on display at Just Art Gallery, Port McNeill, Northern Vancouver Island, British Columbia, Canada. 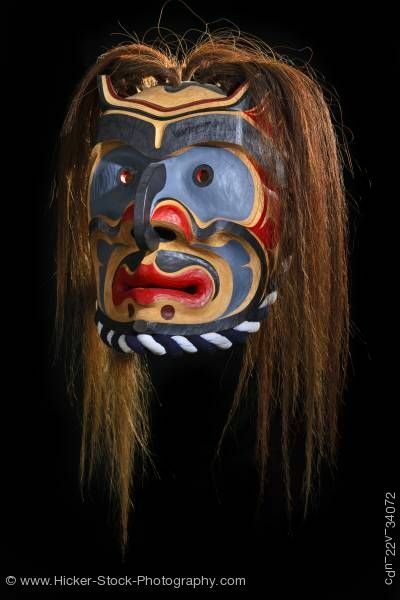 Stock Photos from the collection "Native Art"
This stock photo is of a Bakwas Mask by Don Svanvik, Kwakwaka'wakw First Nations Artist, original West Coast native art, Just Art Gallery, Port McNeill, Northern Vancouver Island, Vancouver Island, British Columbia, Canada. Just Art Gallery, situated in the community of Port McNeill on Northern Vancouver Island in British Columbia, is our art gallery which features authentic Native American artworks by local First Nations artists. Much of the Native American art featured in the gallery is the work of Namgis and Kwakiutl First Nations artists, members of the Kwakwaka'wakw who have a rich culture steeped in traditions spanning many centuries. These traditions continue to be passed down through the generations and is reflected in the work of each artist, showcasing their rich heritage while imparting an insight into their own personal interpretation. The materials used during the creation of these authentic Native American art works are Red Cedar, Yellow Cedar, and Alder. Native Art Gallery - JustArt. Related pictures with keyword "Native Art"